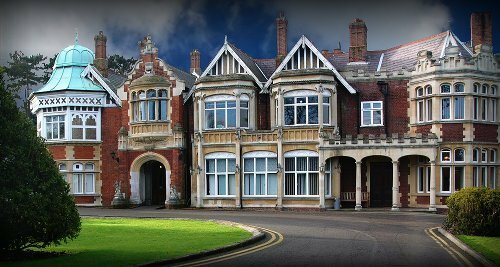 cosmix.org | Bletchley Park to close? In 2000 I visited what is probably one of the most interesting attractions for geeky history buffs in the UK: Bletchley Park. Even back when I visited it, the Park was in a dismal state, badly preserved, run down — definitely far from what it should be, given both the fact that sixty years ago it was a British Government secret installation and its immense importance in World War II — and all that in a country whose culture even today is still fundamentally affected (I’d dare say defined) by the two World Wars. Today, about 8 years since my visit to Bletchley Park, I read at Bruce Schneier’s blog that it may close in a few years due to lack of funds. Having grown up in Hellas, a country with a long history and thousands of ancient sites all over the country, I always thought that the dismal state of Hellenic antiquities was due to the country’s deeply rooted nepotism, corruption, stupidity, indifference and total incapacity for efficient, constructive work. While the British government has quite frequently showed that it’s not far from the Hellenic one, one would expect that they’d care more to preserve a small-ish park and a Victorian mansion. If you appreciate 20th century history and/or cryptography and are visiting the UK (or, better yet, live there), pay a visit to Bletchley Park. The tour may be somewhat indifferent to many, the park itself may be run down, but you’d be seeing first hand the place where Enigma was systematically deciphered during the war and — through your purchase of a ticket and or other souvernirs or donations — will help preserve a piece of modern history. Finally for all those interesting in computing, Bletchley Park hosts a small, and seemingly uninteresting computer museum; this is nothing like some of its counterparts in the U.S.. Nevertheless it has a unique exhibit that’s bound to thrill every computer scientist, programmer, engineer or geek visiting it: a working replica of Colossus. For more information about the Park go to their page here or visit its Wikipedia entry. cosmix.org | Bletchley Park, by Google.